Easily manage and consolidate your program, approving and declining publishers at will that do not meet your quality standards. This section also shows a publisher’s ranking and the amount of traffic they generate for your campaigns. We know how important it is that the right publishers are approved for your program in a timely manner. Accordingly, our new publisher filters allow you to look for viable candidates based on status. As our network functionality improves, we will also enable search by other criteria (business model, state, city, etc.) and the ability to communicate with publishers directly. Minor upgrades, such as the ability to see a live, clickable preview of a link or banner, are designed to help publishers get a better understanding of the content you offer. 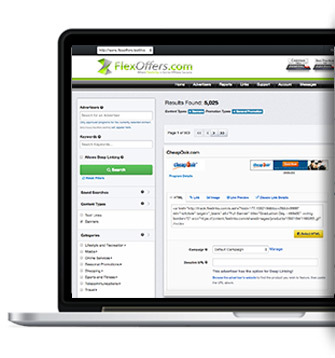 Our new and enhanced Get Links page maximizes all promotional links to help our publishers navigate through the unbelievable number of promotions that are now available in the FlexOffers.com network. These upgrades will allow our publishers to easily search for and find the promotions they want to promote. Our skilled publishers offer multiple years of experience in the affiliate marketing industry. The code field displays the actual code you can paste into your website. Depending on the link type and advertiser settings, you may see tabs for HTML, Click URL for search engine promotion, or Image URL for products. Previous search issues have been addressed, specifically the rare timeouts that occurred when search results yielded hundreds of thousands of results. Publishers can now pinpoint the links they’re looking for without any major delays. We listened to user feedback and implemented a few upgrades that enhance the overall publisher experience in our new and improved Links section. Searching for promotional links to market on websites has never been easier. Make use of our various filters to narrow down your results, saving time and effort when searching for text links and banners to promote. Rather than guide readers to a standard homepage, they can be redirected to a specific product. With thousands of deeplinks in our network, the unique product promotional options are endless.